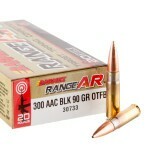 The AR-15 platform can be adapted to fire a variety of calibers other than the original .223/5.56. 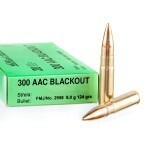 One of the most widespread of these alternatives is the .300 AAC Blackout, also known as the 300 BLK and the 7.62x35mm. 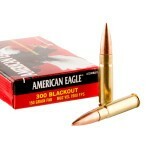 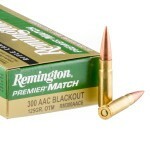 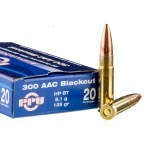 .300 AAC Blackout ammo is an excellent close range performer and one of the best calibers to use with a suppressor. 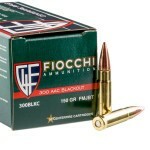 It is named for its developer, Advanced Armament Corporation. 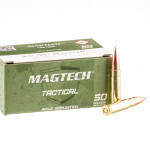 One significant benefit of this caliber is that it uses the same magazines as the default 5.56 chambering without any loss of capacity. 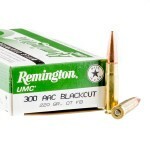 Typically, converting an AR to this caliber requires only a barrel (or more conveniently, an upper reciever assembly) change. 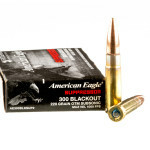 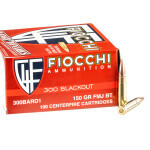 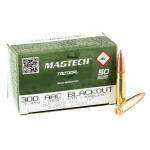 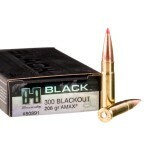 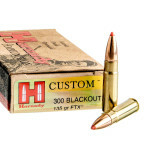 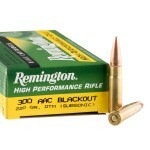 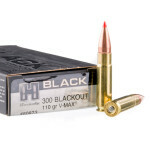 300 Blackout ammo is divided into subsonic and supersonic categories. 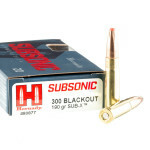 Subsonic .300 BLK ammunition fires a heavy bullet weighing about 220 grains at a muzzle velocity of about 1,000 feet per second. 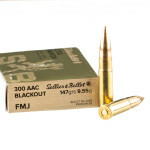 These ballistics are superficially similar to those of the .45 ACP; however, the .300 AAC is designed from the ground up as a rifle cartridge and its spitzer profile and much higher sectional density enables much better medium range performance. 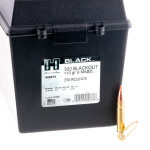 The subsonic velocity of these loads enables the round to be fired in a suppressed weapon without creating a sonic 'boom' or 'crack' and compromising the suppressor's effectiveness. 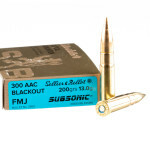 Supersonic .300 BLK ammo is more comparable in external ballistics to the Soviet 7.62x39mm while feeding more reliably in AR-15s due to its non-tapered case. 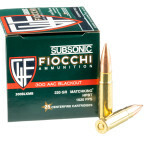 Supersonic .300 AAC loads fire a light 90-125 grain bullet at a muzzle velocity of 2,200-2,600 feet per second. 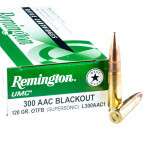 Supersonic ammo in this caliber often uses OTM (open tipped match) bullets intended for competitive and precision shooting; these should not be confused with expanding hollow point projectiles.